Scorpio February 2015 Horoscope predicts that family and domestic affairs will dominate during February 2015 over career and professional concerns. Your social skills are more important than your personal attitude in February 2015. Your growth depends on you compatibility with other people. You have to be flexible and adapt yourself to the environment in order to prosper in life. The Scorpio monthly astrology predictions for February 2015 foretell that career takes a back seat during February 2015. All your achievements on the professional field, be it a job or business, have to be done in collaboration with colleagues. 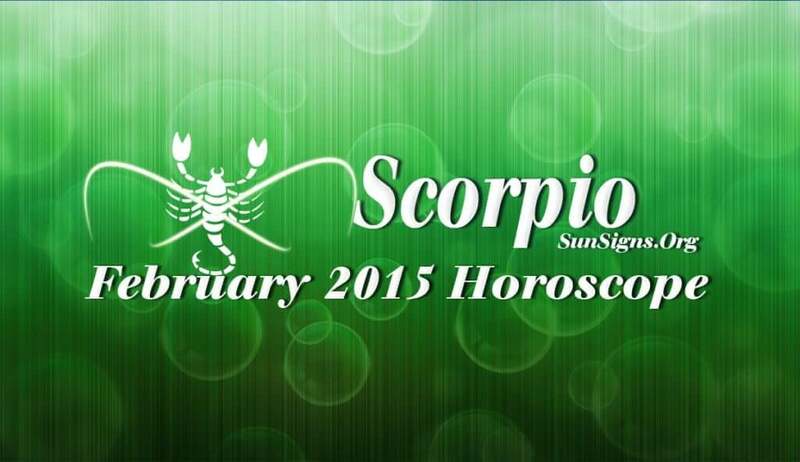 The February 2015 Scorpio financial horoscope predicts that you will have a splendid month with good flow of cash. You should avoid risky investments and use the opportunities that present themselves to enhance your monetary wealth. The Scorpio love predictions for February 2015 forecast that there will be abundant chances of making new romantic alliances during the month. Love might be found in the office environment, but will be more of a fling. So be careful if you fall in love with your boss! This is not a month to take your marriage to the next level by having a child. Your relations with family members will be highly turbulent. You have to adapt yourself to the ever-changing situations in the family environment. The Scorpio 2015 February horoscope predicts that your health will be delicate till the third week of the month. Good sleep is a must. Select a few fitness activities and concentrate on them. It is also necessary to maintain your mental health.